Bet’cha can’t do this. Not many people can cut a perfect arc on a table saw in a thin piece of plywood. Notice how the cut is just the right depth to keep the ply together. Notice how the cut starts in from the side perfectly tangential to the arc. 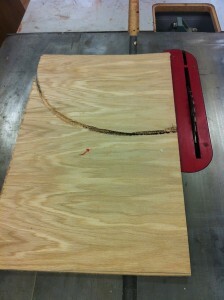 Notice how the cut continues all the way across the workpiece in a perfect arc. Notice the small blood stain in the center of the piece. Maybe you have guessed by now this is a terrible mistake and a big screwup. I was cutting some pieces of plywood for our annual family gingerbread house construction and I failed to pay sufficient attention near the end of the cut. It got away from me in about one tenth of one second and the next thing I knew it was bouncing off the back wall of the shop about 15 feet behind me. Thank goodness I was wearing a face shield and standing to the side as I always do. The only damage, besides my ego, was a broken fingernail and a pretty good scrape to my ring finger from the flying plywood. That thing took off like a helicopter, flew just past my head, all the way across the room and banged into the wall near the ceiling behind me. It was brutal and scary and reminded me all over again how potentially devastating a moment of carelessness can be in the shop. I am sure that many of you out there are looking at my saw and noting the lack of a guard and splitter at the blade. You are right and I deserve that. But for all you beginners out there, note this. I am an experienced woodworker who has used a table saw for years and I know how this kind of kickback happens. It happens because I took off the splitter behind the blade and the piece twisted and the back portion of the saw caught the wood and threw it back at me. But you see, I was just going to use the saw for thirty seconds to make a base for a gingerbread house and it was not a real project, and I know all about this stuff cause I write for Highland and I don’t need any advice from you. That kind of thinking is what gets you hurt. Leave the guard on your saw or at the very least, get an aftermarket splitter behind the blade. And be careful out there. By the way, the way you know you are pretty far gone is when something bad happens, all you can think is “Oh wow, that’s a great blog entry”. I’m really glad you weren’t hurt! And that no one else was. After more than 40 years of working on the table saw, I’m still extremely cautious around it….to the point where I’ve stopped cutting plywood on it almost entirely. I find it much safer to either cut it with a traditional handsaw (thin plywood like you were using cuts very quickly with a 10 or 12 tpi crosscut) or to lay it on a piece of foam board and cut it with a small circular saw. No chance of kickback in either case. Anybody else notice that a Sawstop wouldn’t have made any difference here?